The ideal prosthesis for aortic valve replacement in children and young adults has not been found yet. In recent years there has been a renewed interest in the replacement of aortic valve with the pulmonary autograft owing to its advantages of lack of anticoagulation, potential for growth and excellent haemodynamic performance. The purpose of this study was to review our institutional experience at Alder Hey hospital with the Ross procedure in children and young adults. From November 1996 to September 2003, 38 patients (mean age, 13.1 ± 5.7 years) underwent the Ross procedure for various aortic valve diseases using the root replacement technique. Clinical and echocardiographic follow-up was performed early (within 30 days), 3 to 6 months, and yearly after surgery. Medical records of all patients were reviewed retrospectively. There was 1 perioperative death. 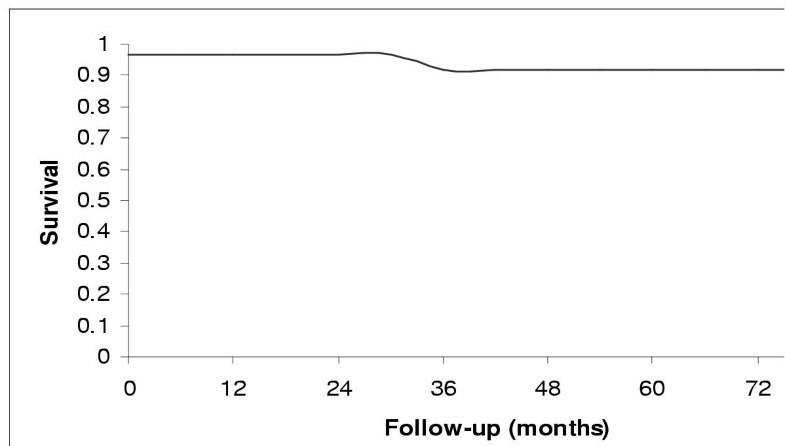 The patients were followed-up for a median interval of 36 months and up to 7 years. One patient died 3 years after surgery secondary to ventricular arrhythmia with overall mortality of 5.3%. Actuarial survival at 7 years was 94 ± 2.5% and there was 100% freedom from reoperation for autograft valve dysfunction or any other cause. Balloon dilatation was required in 2 patients for pulmonary homograft stenosis. The haemodynamics at the latest follow-up were also similar to those at the time of discharge after surgery. There was no progression in the degree of aortic regurgitation for 11 patients with trivial and 3 with mild regurgitation. Our experience demonstrates that Ross operation is an attractive option for aortic valve replacement in children and young adults. Not only can the operation be accomplished with a low operative risk but the valve function stays normal over a long period of time with minimal alteration in lifestyle and no need for repeated operations to replace the valve as a result of somatic growth of the children. The original investigative work that led to the Ross operation was first reported by Pillsbury and Shumway in 1966 . Ross first reported his clinical experience with replacement of the aortic and mitral valves with a pulmonary autograft in 1967 . Initially there was a reluctance to accept the technique of Ross owing to the complexity of the procedure and the unknown fate of the pulmonary autograft. In those days classic valvular prostheses were regarded as the usual option for aortic valve replacement. Nowadays, it is obvious that aortic valve replacement with the classic valvular prostheses is not without the well known disadvantages of degeneration of bioprostheses , thrombo-embolic phenomena and anticoagulation-related bleeding due to mechanical prostheses , and need for repeated operations in younger patients due to continued somatic growth. The ideal valve replacement, particularly in a child, ought to be accomplishable with a low operative risk. It should restore normal valve function, and ventricular function should be returned to as close to normal as possible. In addition, it should require minimal alteration in lifestyle, it should have permanency, and the replacement of the valve should not be required with the somatic growth of the child. Impressed by the results of Ross  and other authors [5–8], we started this procedure in November 1996 at our institution. The purpose of this study was to review our institutional experience with the Ross procedure in children and young adults. The study is a retrospective review focusing on 7-years experience of Ross procedure in children and young adults. All patients who underwent Ross procedure between November 1996 and September 2003 were included in this study. Medical records and charts were reviewed for demographic data, original anatomic diagnoses, prior interventions and details of operative procedure including technical data. Perioperative course and follow-up data was reviewed for conduction abnormalities and arrhythmias, duration of ventilation, neurological sequelae, other postoperative issues and postoperative interventions. All patients underwent detailed clinical and echocardiographic examination early (within 30 days), 3 to 6 months and yearly after surgery. 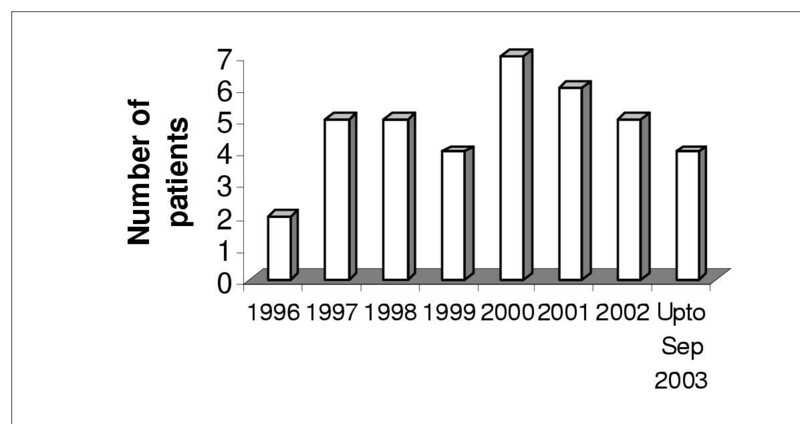 Thirty eight patients (28 males and 10 females) underwent replacement of the aortic valve by a pulmonary autograft (Ross procedure) between November 1996 and September 2003 as shown in Figure 1. 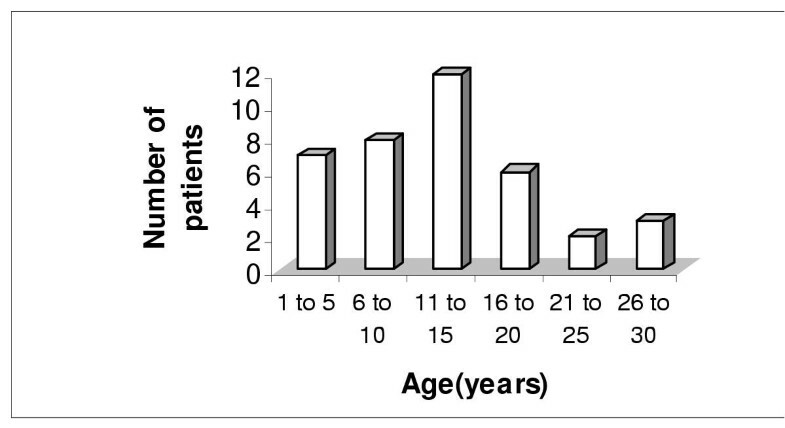 The mean age of the group was 13.1 ± 5.7 years at the time of surgery (median 12.8, range, 1.4–29.7 years). The frequency distribution of age at Ross procedure shown in Figure 2 reveals that most patients underwent surgery below the age of 20 years. Demographic details, dominant valve pathology and hemodynamic lesions are shown in Table 1. Twenty seven patients had undergone previous aortic valve interventions. One patient had balloon dilatation on 3 separate occasions while another had balloon dilatation twice prior to Ross procedure. Two patients had aortic valve repair prior to replacement with pulmonary autograft. One of these patients needed surgery to reattach an aortic cusp which was detached following attempted balloon dilatation. Two of the children had previous surgery for repair of coarctation of aorta and ventricular septal defect, respectively. One patient had a mechanical prosthetic valve which needed replacement due to somatic growth of the patient. The mean follow-up was 33.2 ± 19.1 months (Median 36 months; range, 6–84 months) and was 100% complete. SD, standard deviation; cm, centimetre; kg, kilograms; m2, square metres. * 1 patient had balloon valvotomy × 2 while one had balloon valvotomy × 3. Values in parentheses are percentages. All operations were performed by the same surgeon (M.P.). Standard cardiopulmonary bypass with moderate hypothermia (28°C) was used. Myocardial protection was achieved by antegrade cold blood cardioplegia at 4°C infused through the aortic root or directly into the coronary ostia. Cardioplegia infusions were repeated every 20 minutes. The left ventricle was vented through the left atrium in all cases. The aortic valve was exposed through a transverse aortotomy. This allowed excellent exposure of the valve. All patients underwent aortic root replacement with coronary reimplantation using pulmonary autograft. In all cases a continuous running suture technique was used. In all, except two patients there were no, or only minor discrepancies between the "annulus" and the autograft which were addressed during suturing of the autograft and by using a wider muscle cuff on the pulmonary artery. The aortic "annulus" in effect takes the form of the cylindrical root in which the valvar leaflets are supported in a crown-like fashion . Plication of the annulus had to be done in the two patients with a significantly dilated annulus which was more than 3 millimetres larger than the autograft. A horizontal mattress stitch of 4/0 monofilament suture (Ethicon, Brussels, Belgium) was placed in each of the commissures for plication. The commisures can more precisely be described as the three triangular extensions of the left ventricular outflow tract which reach to the level of the sinotubular junction . A cryopreserved pulmonary homograft was used for reconstruction of the right ventricular outflow tract in the first 19 patients and thereafter Contegra® valved conduit was used due to nonavailability of the appropriate sized homograft. Reconstruction of right ventricular outflow tract was done before removing the aortic cross-clamp. The conduit for reconstruction of right ventricular outflow tract was oversized whenever possible. The perfusion data is shown in Table 2. Values in parentheses are percentages ICU, intensive care unit; RVOT, right ventricular outflow tract. Early mortality was defined as any death within 30 days or during initial hospitalization. Postoperative valve-related morbidity and mortality were evaluated and reported according to standard definitions . All patients had a clinical examination, New York Heart Association functional class assessment, chest x-ray, electrocardiogram, and echocardiographic assessment before discharge, at 3 to 6 months, and at yearly interval thereafter. The echocardiographic assessment included color flow Doppler to assess the severity of autograft insufficiency, which was graded according to the method described by Perry at al . The peak transvalvular flow velocities were measured with continuous wave Doppler and peak gradients were calculated. The haemodynamics across the pulmonary homograft and Contegra® conduit were also measured. Data are presented as mean ± SD (unless otherwise stated). Patient survival analysis and time-to-event analysis was performed using Kaplan-Meier methods. The paired Student's t-test was used for analysis of the differences between measurements taken after surgery and at the latest follow-up. A p < 0.05 was considered significant. Statistical analysis was performed using Microsoft Excel 2000 and Statistical Package for the Social Sciences, version 10.0 for Windows 2000 (SPSS, Chicago, Ill., USA). One patient died suddenly 11 days after surgery. Ventricular arrhythmia was suspected as the most likely cause. One late death 3 years after surgery was also attributed to ventricular arrhythmia. The child was brought to the accident and emergency department in a state of shock. Initial resuscitation was unsuccessful. Emergency sternotomy did not reveal any obvious cause for the clinical presentation and patient died despite vigorous attempts to resuscitate. Post mortem failed to reveal any pathology of the valves or coronaries. Ventricular arrhythmia was suspected as the most likely cause of death. The actuarial survival at 7 years was 94 ± 2.5% (Figure 3). Conduction abnormalities and arrhythmias were the commonest perioperative morbidity. 1 patient had transient atrial fibrillation and 1 had nodal rhythm which reverted back to sinus after 24 hours. Two patients had nonsustained ventricular tachycardia limited to the first 24 hours. Two patients had ventricular ectopics which responded to correction of serum potassium levels. 3 patients required inotropic support in the first 12 hours after surgery. However, inotropic support was gradually weaned off over the next 24–48 hours. 1 patient had reoperation for bleeding. 3 had pneumothorax secondary to removal of chest drain. This was managed conservatively. Two patients had pericardial effusion. 1 required aspiration under echocardiographic guidance while the other responded to conservative management with diuretics. Two patients developed postoperative pleural effusion which was managed conservatively. The duration of mechanical ventilation, cardiac intensive care unit length of stay, and total hospital length of stay are shown in Table 2. Severity of dyspnoea was assessed by the New York Heart Association classification. Preoperatively, 23 patients (60.5%) were in New York Heart Association class I, 12 (31.5%) were in New York Heart Association class II and 3 (7.9%) were in class III. All except 3 patients were in New York Heart Association class I at their last follow-up. In our series we did not experience any early or late autograft complication necessitating autograft replacement. Early or late clinically significant autograft leakage was not seen. Other possible autograft-related complications such as bacterial valve endocarditis or thromboembolic phenomena were also not encountered. None of the patients required replacement of the autograft during the follow-up period. Echocardiography demonstrated excellent autograft function. The peak aortic gradient which was 8.0 ± 3.0 millimetres of mercury at the time of discharge did not change much as it was 7.8 ± 3.8 millimetres of mercury (p = 0.7) at the latest follow-up. 11 patients showed trivial while 3 had mild aortic regurgitation at the time of discharge and the degree of regurgitation remained static on color flow Doppler at the latest follow-up. Pulmonary homograft showed a significant increase in peak gradient from 11.1 ± 3.8 millimetres of mercury after surgery to 14.5 ± 7.1 millimetres of mercury (range, 5.8–49 millimetres of mercury; p = 0.01). Two patients needed balloon dilatation for pulmonary stenosis. Another 2 patients had a pulmonary homograft gradient of ≥40 millimetres of mercury. 5 patients had mild while one patient had moderate pulmonary homograft valve insufficiency. They all are asymptomatic with normal right ventricular function and minimal dilatation of right ventricle. None of the patients needed reoperation due to homograft dysfunction. Contegra® conduit has been used since November 2000 for the reconstruction of right ventricular outflow tract in all patients undergoing Ross procedure at our institution. The use of Contegra® was prompted by the nonavailability of appropriate sized homograft. Early echocardiographic follow-up of this conduit has shown it to be a useful replacement for pulmonary homograft. 3 patients were diagnosed with mild regurgitation after surgery which has remained stable at the latest follow-up. The peak gradient of 11 ± 3.9 millimetres of mercury after surgery was 12.4 ± 6.7 millimetres of mercury at the latest follow-up (p = 0.35). In our series excellent midterm results with physiologic gradients and clinically insignificant incompetence, or none at all, of the autograft have been achieved in the majority of patients. There was one early and one late death with an overall mortality rate in this series of 5.3%. This is equivalent to that in prior reports [12–16]. The total morbidity was also acceptably low while the rate of freedom from reoperation in our series is 100%. We have performed all operations as root replacement. This in our experience maintains the anatomy and the three-dimensional geometry of the autograft and thus results in a more consistently competent autograft valve compared with the intraaortic techniques of subcoronary implantation or inclusion root . Moreover, using this technique it is possible to completely remove all aortic root components that are abnormal. A 100% freedom from reoperation has been accomplished mainly if not entirely by meticulous attention to technical detail. Transferring the pulmonary trunk as a complete free-standing root into the aortic position seems to offer the best chance for achieving an undistorted pulmonary valve. Size discrepancy between the aortic root and the pulmonary trunk is always corrected by adjustment of the size of the aortic root. No doubt that it is a technically demanding and time consuming procedure with cross clamping time more than twice as long as for a simple aortic valve replacement with mechanical or bioprostheses . However, despite the extra time of cardiac ischemia and long cardiopulmonary bypass duration, the patients recover rapidly as evidenced by short ICU stay time and duration of hospital stay. Perhaps this is related to the optimal haemodynamic performance associated with the Ross procedure. Exercise performance after the operation is especially impressive as shown by the New York Heart Association class of study population at the latest follow-up, making this operation helpful to athletic individuals and growing children. We think that an important factor in determining optimal functional outcome after surgery is the actual timing of intervention itself. Previously due to replacement with prosthetic valves surgery was delayed in growing children to avoid repeated replacements. This would result in deterioration of cardiac function especially in children with aortic regurgitation. Since there are fewer concerns regarding the need for early replacement of the aortic valve after the Ross procedure , we tend to replace the diseased aortic valve at an early stage especially in children with aortic regurgitation. This is in agreement with Cheung et al  who have concluded from their study of children with aortic regurgitation having Ross procedure that postponing intervention to a later stage of the disease is more likely to be associated with a more dilated ventricle, and disruption of the short axis architecture, despite "successful surgical repair". Another important finding of our study is the relatively stable autograft valve function in patients with bicuspid aortic valve. 20 patients in our study had bicuspid aortic valve. Follow-up for 7 years has not shown any unusual dilatation or valve dysfunction and therefore we can at this point, based on our results, assume that Ross procedure in patients with bicuspid aortic valve does not predispose to early autograft failure. However, a longer follow-up is needed to substantiate this claim. The pulmonary homograft in the right ventricular outflow tract is regarded as the limiting factor in the long term success of the Ross procedure. During follow-up, no reoperation was needed for pulmonary homograft dysfunction although two patients needed balloon dilatation for pulmonary stenosis. In the present series, 8% (2/25) of the patients had a gradient > 40 mm Hg across the homograft. This was relatively high compared with some of the other series [21, 22]. Yet it substantiates the claim that the right ventricular outflow tract is the predominant 'weak point' of the Ross procedure . Our explanation for lack of reoperation for pulmonary homograft dysfunction even after 7 years is that unlike aortic homograft, pulmonary homograft lasts longer due to less intrinsic calcium and thickness. Moreover, transcatheter techniques are now well established and patients can have longer freedom from reoperation as these techniques might be able to extend the life of the homograft without reoperation. Also, the threshold for surgical intervention in case of pulmonary homograft insufficiency is high as it is often seen that wide-open pulmonary insufficiency is tolerated for 15 to 20 years before right ventricular dilatation sets in. Another important feature of our series is the use of Contegra® for the reconstruction of right ventricular outflow tract. Contegra® is a biological valved conduit consisting of a glutaraldehyde-preserved heterologous bovine internal jugular vein having a trileaflet venous valve. Since November 2000 Contegra® has been used in 13 patients at our institution. Nonavailability of appropriate sized homograft prompted us to use the Contegra®. We have separately published our results of the use of Contegra® in Ross operation . We find it to be an attractive option for use as a homograft alternative in Ross operation. Our choice is guided by the fact that this new conduit has provided consistently good results in the first three years of its use [24–28]. Only 3 patients developed mild regurgitation after surgery which is stable upon follow-up and the gradient across the valve has not shown a significant increase. In addition, excellent off-the-shelf availability, easy tailoring and suturing, large variety of available sizes (12 to 22 millimetres internal diameter), no need for proximal or distal extension and adequate hemodynamics are some of the other advantages which make Contegra® our first choice for right ventricular outflow tract reconstruction after Ross operation . It must be taken into consideration that this is a retrospective observational study with a relatively short median follow-up period. The pulmonary autograft, being the patient's own tissue, is not subject to immunologic degenerative changes, is free from risks associated with anticoagulation and offers excellent haemodynamics. All these features make it an excellent choice for children and young adults requiring aortic valve replacement. SGR conceived and designed the study, did literature search and performed the statistical analysis. MP carried out surgery and did critical review of the manuscript. Both authors read and approved the final manuscript.